Last Friday’s Summer Fair was a roaring success! The school was buzzing with excitement and there were great crowds of people everywhere. The sound of money changing hands could be heard across the school whilst squeals of excitement rang out as people won various prizes. 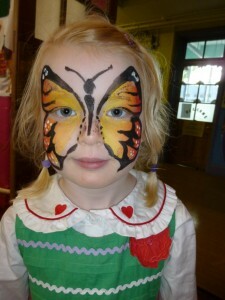 Butterflies, tigers, flamingos, princesses wandered the hall after their visit to the face painting stall. Children competed to complete the inflatable obstacle course, bounced high on the bouncy castle and showed off their golf skills. Tobolas were very popular as usual with queues of people trying their luck. Bottles were won, some wanted, some not. The raffle prize winners went away with a huge grin after winning the large cash prizes! There was lips being licked all around the school as people sampled the many edible delights. The smell of the BBQ filled the playground. Candy floss, sweets and cakes were being eaten as people maneuvered their way through the crowds. Some wonderful performances from a myriad of people entertained the crowd. A wonderful evening was had by all!